5.1 x 3.8 x 3.1 in. Replacing both the Sony A37 and A57 DSLRs in one fell swoop, the Sony A58 offers advanced photographic features and picture-taking skills at a consumer-friendly price. The A58 takes a big step up in resolution with a new 20.1-megapixel APS-C sensor, and it delivers pictures that are sharp and detailed, rivaling the image quality of much more expensive cameras. Although some sacrifices had to be made to drive down the cost -- namely a plastic lens mount rather than a metal one, and a simplified LCD screen -- the Sony A58 still stands out as one of the best entry-level DSLRs we've ever reviewed, as well as one of the best camera values on the market today. The Sony Alpha SLT-A58 started shipping in the U.S. market in April 2013. It comes bundled with the DT 18-55mm F3.5-5.6 SAM II zoom lens for US$600. Just a year after Sony released two Translucent Mirror-based DSLRs -- the entry-level Alpha A37 and step-up Alpha A57 -- the company follows on with the Sony Alpha A58, a 20.1-megapixel model that effectively replaces both of them. It's almost as if Sony merged the earlier designs to create a still-sophisticated camera at a more consumer-friendly price. The A57 kit originally retailed at US$800, and the new A58 comes in US$200 cheaper. So while the Sony A58 boasts some key upgrades that weren't available on either earlier camera, it's not surprising that it also makes some sacrifices to drive down the cost. The A58 may not be a true successor to the A57, but it appears to be an excellent value for beginners. The Sony A58's key upgrades include a higher-resolution, 20.1 megapixel image sensor (vs. the 16.1 megapixel chip used for the A57 and A37), an Organic LED electronic viewfinder, and Sony's proprietary Multi-Interface hot shoe. The A58 also brings a significant improvement in battery life. Conversely, compared to the A57, sacrifices made in the A58 include a plastic lens mount, a slower burst shooting rate, and a downgraded LCD monitor. It also replaces the Sony A57's progressive-scan 60p frame rate for Full HD video with an interlaced 60i option, and reduces the highest bitrate from 28 Mbps to 24 Mbps. But these are only the most significant differences; there are a number of other changes, as we'll see. While plastic mounts have been widely used on lenses, and the one on the A58 appears to be high quality, we still do have concerns about its durability in the longer term. It's one thing to place a plastic mount on a lens, which receives wear only whenever that specific lens is mounted or removed. It's another thing entirely to put a plastic mount on the camera body, which will be worn every single time any lens is mounted or removed. Of course, an entry-level camera won't be subjected to the frequent lens changes that a pro or enthusiast camera might be, and perhaps this is what Sony is banking upon. Looking at the rest of the body design, the basic control layout is almost completely unchanged, with two exceptions: The exposure compensation and zoom buttons have switched places. The former now occupies prime real estate behind the shutter button, and the latter has been demoted to the rear panel. On the rear, it's immediately obvious that the A57's bottom-mounted tilt/swivel LCD panel has been replaced by a new tilt-only display that's less versatile. On the top deck, though, there's Sony's new Multi Interface hot shoe, something we've seen only on a few of the company's more expensive cameras until now. The Multi Interface shoe provides not only for flash strobes, but also for other accessories such as external microphones, viewfinders, and more. It's a relatively young system so far, but offers quite a bit of scope for extending the A58's capabilities in the future. The new Sony Alpha A58 is something of a 'tweener. It is, by default, the company's entry-level APS-C DSLR. At the same time, it offers a ton of photographic capabilities that would also appeal to enthusiast shooters. As such, it sits in a unique position in a fiercely competitive sector of the camera marketplace, replete with formidable rivals from the likes of Canon, Nikon and Pentax. With the A58, Sony devised a camera that delivers virtually all of the high-tech features built into the enthusiast-targeted, 16.1-megapixel Sony SLT-A57 and the consumer-friendly, entry-level SLT-A37 -- plus a number of significant technological upgrades -- at an enticing price. What they came up with is an ingenious strategy, and a remarkably adept camera that delivers impressive value for both beginners and serious photographers alike. The Sony A58 is a lot more than a so-called "price point" camera. Full disclosure: I own a Sony A57, so going into the review I was both excited by the new model, but also skeptical of what it might leave out. Let's take a look at how the Sony A58 stood up to such expectations. Read our Sony A58 Field Test for real-world handling and performance. Sensor and image processing. Moving beneath the skin, the Sony Alpha SLT-A58 is based around a higher-resolution Exmor APS HD CMOS image sensor than those of its predecessors. 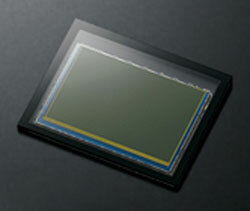 Where the A37 and A57 were both 16.1 megapixel cameras, the Alpha A58 features a 20.1 effective megapixel sensor. The sensor is mounted on a movable platter that allows it to provide for SteadyShot Inside image stabilization. Total resolution of the chip is 20.4 megapixels, and despite the bump in resolution (accompanied by a decrease in pixel pitch), Sony has retained the same sensitivity range of ISO 100 to 16,000 equivalents for its new camera. Of this range, everything from ISO 100 to 3200 equivalents is available under automatic control. Perhaps explaining its ability to retain the same sensitivity range while increasing resolution, Sony notes that it has updated the BIONZ image processing algorithms used in the Alpha SLT-A58. The new algorithms apply variant levels of noise reduction and sharpening across the image, based on the degree of subject detail detected. According to the company, these algorithms are the same as those used in its flagship Alpha SLT-A99 model. Click to read detailed Sony A58 techical info! How does the A58's image quality compare to popular APS-C cameras? We compare the Sony A58 to its predecessor, the Sony A57, and to other competing models such as the Canon T5i, Nikon D3200, Pentax K-50 and Sony NEX-6. Read our Image Quality Comparison to see how the Sony A58 stacks up! How do the Sony A58's images look printed? We could say the Sony A58 does a very good job in the print quality department from JPEGs, but when you consider its body-only street price of somewhere under $600, it'd be fairer to say it does an excellent job. We don't take price or any other factors into consideration when evaluating prints, just how they look, but drawing a conclusion is another story. Simply put, if you are looking at stepping into your first DSLR, or if you need a solid back-up to your more advanced model, the A58 can be counted on in the JPEG image quality department across the ISO spectrum. Read our Sony A58 Print Quality analysis to see how large you can print! Should this SLT be your next DSLR? Sony created its entry-level A58 DSLR by taking its well-regarded predecessors, the entry-level A37 and enthusiast-geared A57, adding some significant tech upgrades -- most notably its new 20.1-megapixel APS-C sensor -- and then making just a few compromises to deliver the new model at a price point that's a full $200 lower than the A57. In doing so, the A58 effectively replaces both previous models (which have been discontinued). But does the camera split the difference and sit somewhere in the middle of these two cameras, or does it outshine them both? Well, in terms of JPEG image quality, it's clear that the Sony A58 has taken a huge step forward. The higher-resolution sensor helps it deliver stunning photo quality that's sharper and more detailed than its predecessors'. In fact, the A58's images stack up well against those from much more expensive, enthusiast-level DSLRs. You can even get excellent 30 x 40 inch prints at ISO 100 and 200 from the camera, a finding that truly surprised us. Other big steps forward include a bright-and-clear, 1.44M-dot Organic LED viewfinder, the addition of Sony's proprietary Multi Interface hot shoe, and improved battery life. Otherwise, the A58 borrows a lot of its tech from the A57, including the 15-point continuous AF system (with three cross-type points) which allows the DSLR to autofocus quite quickly and accurately in most situations. The physical design and size of the two cameras remain roughly the same. So does the control layout, save for a few minor differences. Read the Sony A58 Conclusion for our final verdict!